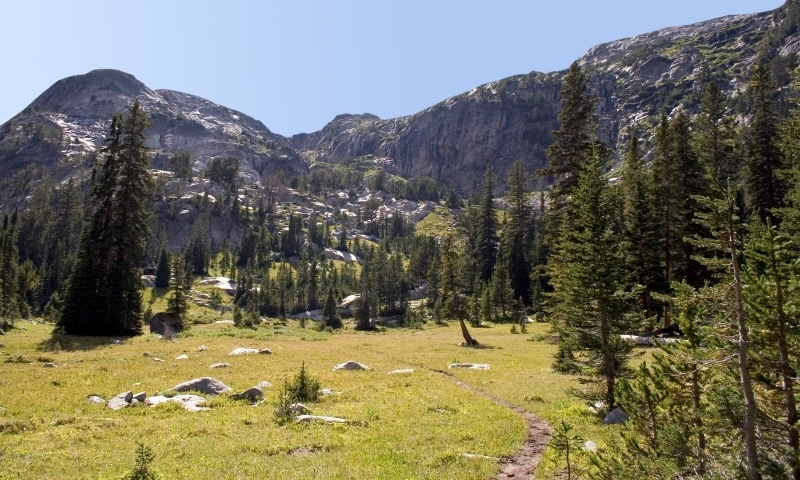 Hiking and backpacking the many diverse trails around Cody, Wyoming offers the visitor some spectacular scenery as well as some longed-for solitude in a gorgeous natural environment. The best way to experience the beauty of the Wyoming lands around Cody is to hike the trails. Enjoy the pine-scented air and alpine meadows as you move along through Mother Nature’s wondrous backcountry. The Clarks Fork District in Shoshone National Forest provides a number of trails of varying lengths, ideal for any level hiker. Many of these trails have light use, thus you get some privacy and elbowroom. The Greybull District in the Shoshone National Forest has a great many trails of pristine beauty, some climbing to over 3,000 feet in elevation change for those adventurous hikers willing to take the challenge. One of the most famous trails in the Wapiti District of the Shoshone National Forest is the Blackwater Fire Memorial trail, which is a designated National Recreation Trail. Other trails are of moderate difficulty and of moderate to heavy use, indicating their popularity. If you like those long, exciting hikes, you’ll find the Blackwater Natural Bridge Trail, only 40 miles outside of Cody, offers some great overnight experiences. Get great views of the natural rock arch on this strenuous hike. The Elk Fork and the Greybull River Trail are a couple of other hikes that have to be experienced to be believed.